Your time is very valuable. With your daily work and family commitments, you often do not have the time for multiple or lengthy appointments with your dentist in Las Cruces. As a result, you may be tempted to put necessary treatments on hold. At Painted Skies Dental Center, we understand you need more flexible options, which is why we embrace the latest technologies to offer convenient services. With CEREC technology, we provide same-day dentistry to take the headache and hassle out of receiving a dental restoration. With CEREC in Las Cruces, your entire procedure, including your permanent restoration, will be completed in just one appointment. In the past, it would require two separate dental visits. However, the whole process is simplified and more convenient without compromising the quality of the results when choosing the most advanced technology. Traditional crowns involve one appointment to prepare the tooth and to take impressions. The impression process itself is often challenging because you need to hold a poor tasting, messy, and uncomfortable material in your mouth in order to create the restoration. Now, you do not have to deal with this uncomfortable process. Your tooth is prepared and then we take 3D images of your tooth. It is quick and comfortable. With a traditional approach, the impressions are sent to an off-site dental lab. While you wait for it to be made, you would need to have a temporary one attached and then come back for a second appointment to have the permanent one bonded. Not with CEREC. The digital impressions are sent to our in-office CAD/CAM software where we create the specifics of your restoration, including the size, shape, and color. Then, we send the information to our in-office milling machine. Using a single block of ceramic material, it will be made right in our office in about an hour. 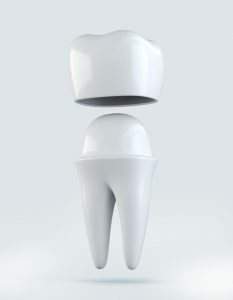 It is then ready to be bonded to your tooth, eliminating the need for a temporary crown or a second appointment. The technology can be used for both restorative and cosmetic procedures where a dental crown is needed, allowing you to save valuable time and money with just one appointment. Although the restoration is created in just one day, you benefit from uncompromised results. It will be strong and durable while looking like a natural tooth. With the use of the 3D scans, there is less room for error when compared to traditional impressions. As a result, you can rest assured it will be the exact size and shape you need for the ideal fit. In addition, we can customize the color to ensure it blends in seamlessly with your natural teeth. Now, you no longer need to put your dental care on hold due to time constraints. We provide same-day services to quickly receive the restoration you need in just one day. If you are ready to experience the difference with CEREC, contact Painted Skies Dental Center today to schedule your consultation.